The first half of the Olympic Games is over, and the athletes from Great Britain were pretty successful so far. In the medal table, Great Britain is on position 2 after the USA. But which news publishers were able to benefit from the British athletes’ success and reach the highest visibility in the Google News Boxes? 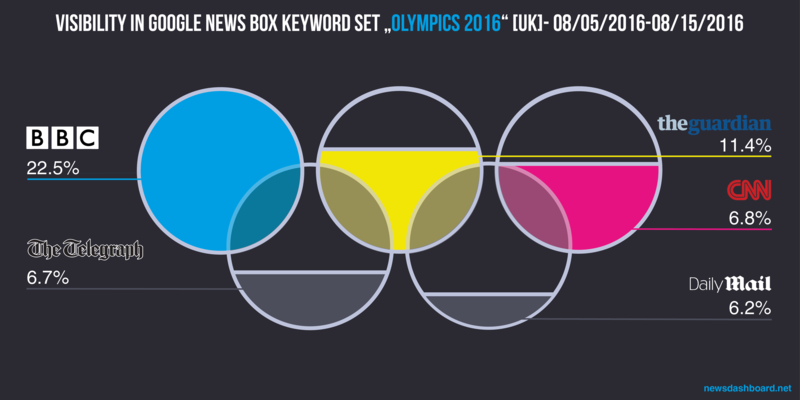 For the following analysis we created a set of keywords around the Olympic Games (you will find a list of the keywords at the end of this text) and analysed the corresponding News Boxes. We chose 5th August – the day of the opening ceremony – until 15th August as our time frame for the half-time analysis. Before looking at the data created by the Trisolute News Dashboard, we cast a glance at Google itself. As the following screenshot shows, Google has developed a special information chart for the Olympic Games. It can be found at the top of the SERP (Search Engine Result Page) and contains information for the corresponding keyword (in this case: Andy Murray). This leads to the assumption that Google News “withholds” some traffic from the news publishers, because the Google News Boxes with the latest articles for Olympic keywords are further down on the SERP, and the users can get their information straight from Google. Nonetheless will those news publishers, which have been placed prominently in the Google News Boxes, have gotten more traffic than those that were rarely able to rank in the News Boxes. The following graph shows the top 10 concerning visibility in the Google News Boxes. 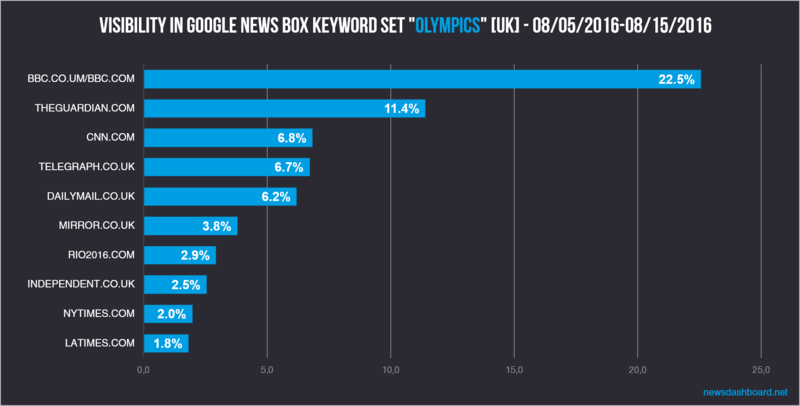 With a visibility of 22.5 percent in the overall time frame and considering all keywords from our Olympic set, the BBC is leading by far and has thus the highest visibility in the Google News Boxes. Theguardian.com follows on position 2 with a visibility of 11.4 percent. Then there are three news publishers with a visibility of around 6 percent: cnn.com, telegraph.co.uk, and dailymail.co.uk. The official page for the Olympic Games, rio2016.com, is also present in the top 10 and has a visibility of 2.9 percent in the Google News Boxes. Furthermore, some American news players are successful in Great Britain, like for example cnn.com, nytimes.com, and latimes.com. bbc.com/bbc.co.uk has by far the highest visibility in the Google News Boxes. 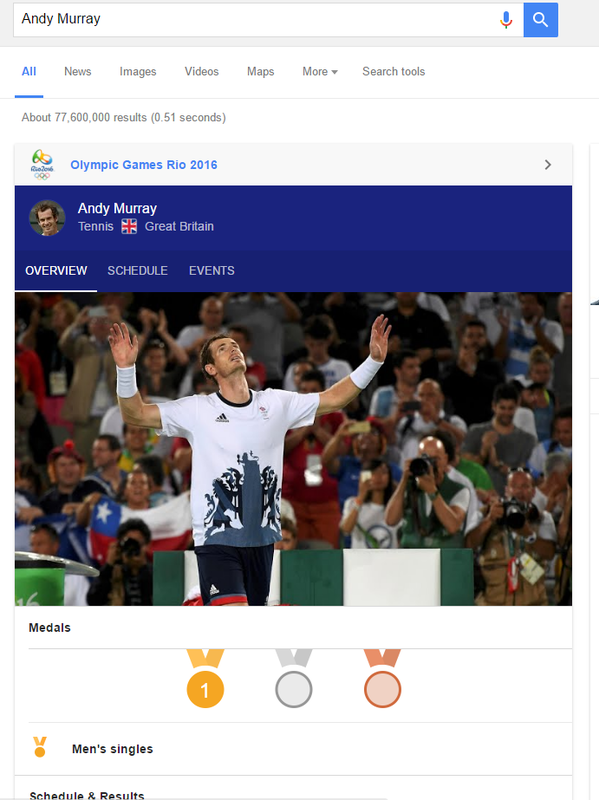 Andy Murray wins his second gold medal – who wins his Google News Box? Tennis ace Andy Murray won his second gold medal in Rio. He thus made history, because he is the first to win gold twice in a row in a game of singles. There is no clear winner in the Google News Box for the keyword “Andy Murray” on 14th August. Various news publishers hold the first position in the news box for longer periods of time. While skyports.com is on position 1 between 1 a.m. and 4 a.m., the BBC is mostly able to prevail between 5 a.m. and 4 p.m. Afterwards, telegraph.co.uk and theguardian.com are able to win the desired position in the News Box. 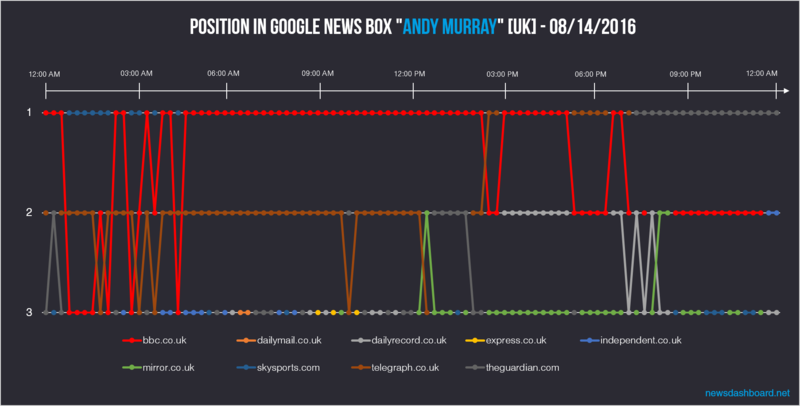 Further news publishers that ranked in the Andy Murry News Box are, amongst others, dailyrecord.co.uk and mirror.co.uk. During the day until the afternoon, the BBC ranked on the first position in the News Box; before and afterwards, other news publishers were able to prevail. In summary, the BBC is the winner of the first half of the Olympics. The BBC has by far the highest visibility in the UK Google News Boxes in the overall period under review. But other publishers have been successful as well, for example theguardian.com, telegraph.co.uk, or dailymail.co.uk. We will see if the second half of the Olympics change somthing in the picture. bbc.com/bbc.co.uk strongest, The Guardian, CNN, The Telegraph and Daily Mail follow. 2016 summer olympics opening ceremony, adam peaty, alistair and jonny brownlee, andy murray, basketball, brownlee brothers, charlotte dujardin, chris froome, elissa downie, greg rutherford, gymnastics, ioc, julija efimova, jasmin carlin, jessica ennis-hill, max whitlock, medal standings, michael phelps, mo farah, nicola adams, novak djokovic, olympic games, olympic games 2016, olympics, olympics 2016, olympics athletics, olympics favourites, olympics gymnastics, olympics news, olympics results, olympics rio, olympics rio 2016, olympics swimming, opening ceremony, rio, rio 2016, rio de janeiro, rio olympics, rowing, russia, summer olympics, swimming, team uk, usain bolt, volleyball, wayde van niekerk, women´s boxing.